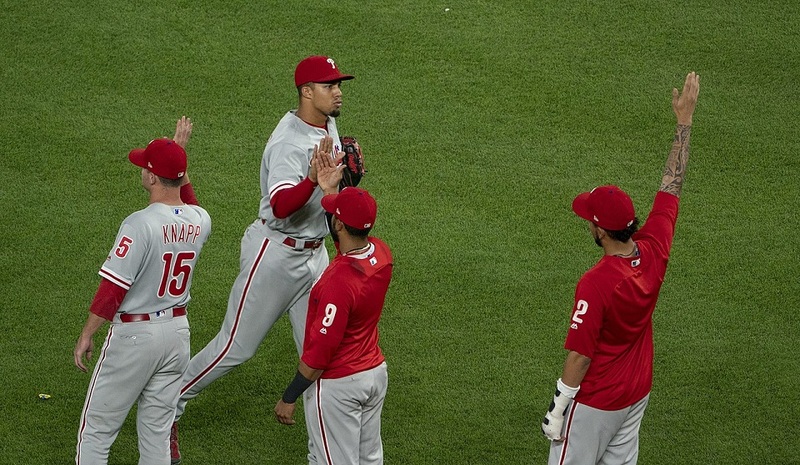 As recently as one month ago it was a foregone conclusion that the Philadelphia Phillies would finish with a winning record in the 2018 season. On August 18 the Phillies were 68-55 and just one game behind the Atlanta Braves in the loss column in what seemed to be a spirited race between the two rivals for the National League East Division crown. The Phillies led the NL Wildcard standings on that day, but had a bunch of teams right on their heels. The Saint Louis Cardinals and Colorado Rockies were just a game behind them, with the Milwaukee Brewers two back and the Los Angeles Dodgers three games behind. As every Phillies fan now knows, the team would not remain in either race. Instead the Phillies have collapsed over this past month, going 8-19 in that time. “It’s just not going well all the way around,” Phillies pitcher Jake Arrieta said per Jim Salisbury of NBC Sports Philadelphia following last night’s loss to the New York Mets. The foregone conclusion of a winning season is now a thing of the past. Yes, the Phillies are still three games over the .500 mark. Yes, with just 13 games left to play there is a chance that 2018 still turns out to be a winner. Yes, they are still mathematically alive in both the division and wildcard races. But let’s take off the rose-colored glasses and get real for a minute. This 2018 Phillies team was always doing it with smoke and mirrors. Educated fans didn’t need me to point out – though I did a number of times – that this team as currently constructed was not good enough offensively or defensively to sustain their place in the standings without some dramatic, significant changes. Had they actually wanted to win this year, that need for change needed to be recognized by management a couple of months ago, despite the winning record. They either failed to recognize it, refused to believe it, or decided to ignore it. If either of those first two possibilities were the Phillies actuality, then the worst thing that could possibly happen now would be for the team to suddenly start winning again. The Phillies would now need to finish the season 6-7 over their final 13 games in order to finish with a winning record at 82-80. Of course, anything better would also do the trick. However, should they continue at their pace of this past month, the club will actually finish more like 4-9. That would give them an 80-82 mark at the season’s conclusion. While it would be a 14-game improvement over last season, many fans would feel disappointed. Don’t count me among them. My concern would be that the Phillies somehow catch fire and finish with something like a 10-3 record. Such a positive sprint to the finish would leave them with an 86-76 mark. And since seven of those games are against the Braves, it would likely mean that they fall just a couple games short of a division title. Probably just a few shy of a wildcard berth. Now why would that concern me? Shouldn’t that actually be exciting? I believe that if the Phillies management has truly failed to recognize the shortcomings in the current construction of the roster, if they continue to mishandle some players and over-value others, then they will pay the price next season and well into the future. I have been doing MLB power rankings of all thirty teams on a fairly regular basis. My rankings are not subjective. They are not based on my opinion. I utilize four categories: winning percentage, runs scored, pitching OPS, and fielding percentage. Imperfect, sure. But certainly better than some writer or “insider” personal opinion. Those statistics reflect on how the team is actually performing at the plate, on the mound, in the field. I research how each team ranks in those categories, assign a 1-30 value, and add up the totals to get my rankings. On July 1, the Phillies were eight games over .500 and were tied for the ninth-best record in all of Major League Baseball. And yet my rankings had them at just 23rd among the 30 ball clubs. At the MLB All-Star Game break the Phillies had moved into first place and had pushed to 11 games above that .500 mark with the eighth-best record in baseball, third-best in the National League. And yet the power rankings had them just 16th at that point. It would be their highest ranking of the season. The next power ranking wasn’t released until August 15, which is about when the Phillies were at their peak in the standings. They were fourteen games over .500, held the top wildcard position, and had still been in first place in the division as recently as four days earlier. And yet the power ranking had dropped them to 17th, down a notch from a month earlier. By the Labor Day power rankings, they were tied for 18th. In the most recent published just days ago, they had sunk to 21st as the collapse continued. What should all of this reveal? That despite some believing there was a contending Phillies team in town, that was never really the case. What the team was doing was out-performing their statistics. Over the long course of a six-month, 162-game season they rarely, if ever, works out well. These Phillies are what they are: better than the last five years, but not yet good enough to truly contend. A hot streak now, one in which they give false hope to fans and perhaps even trick management into making foolhardy decisions in planning for 2019, would do more harm than the good found in watching a few more wins here at the end. I am honestly sorry for coming across as a downer. It’s not my usual nature, which is to be the original “glass half-full” guy. But I’m also never going to be a Pollyanna, lying or misleading fans. The best thing for the future of the Phillies would be to continue being what they are, and finish as no better than a .500 team for this year. Originally published at Phillies Nation as "Winning is the worst thing that could happen to Phillies over final two weeks"